The story of an American congressman who fought for his free will, after learning that all this time the way of life was regulated by The Adjustment Bureau. Brooklyn in 2006, David Norris (Congressman) a congressman who just failed in his attempt to become a member of the Senate. Before going to make a speech after his defeat David Norris met Elise Sellas. This meeting changed the perspective of David Norris and influenced his defeat speech. This speech attracted a lot of sympathy, until David got a lot of support to come back in the 2010 senate election. A month later David began to prepare himself for his new job. Harry Mitchell, an Adjustment Bureau, a secret and supernatural body, was tasked by his supervisor Richardson to ensure David Norris spilled his coffee at 7:05 a.m. to be late on the first bus. Mitchell fell asleep while waiting for David to pass. David boarded the first bus, and on the bus David met Elise again and promised to contact Elise again. When he arrived at the office, David found his friend Charlie Traynor in a frozen state and was being examined by a stranger. David tried to escape, but failed and was taken to a warehouse. Richardson explained that they were from Adjustment Bureau. 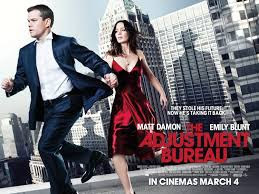 The Adjustment Bureau is tasked with ensuring that people's lives go according to their existing plans. Adjustment Bureau burns Elise's phone number that David just got on the bus the next morning. David was also reminded that if David leaked the existence of The Adjudication Bureau, they would reset his brain. The loss of Elise's telephone number resulted in David being unable to contact Elise. For three years David tried to meet Elise by always riding the same bus, hoping that he would be able to meet Elise again on the bus. His efforts turned out to be fruitful, they reconnected, it turned out that Elise was a very talented Ballet dancer. Seeing this development, The Adjustment Bureau tried to separate the relationship that was between David and Elise. Because of seeing increasingly out of control developments, The Adjudication Bureau assigned senior members Thompson. Thompson forced David to meet him. David Medebat Thompson by stating that humans have free will. Thomas states that humans do have free will, but cannot be trusted for big things. Evident from the wartime that humans created when The Adjustment Bureau did not interfere. Since the Cold War era, the Adjustment Bureau has decided to re-interfere in human life. Thompson stressed that David could become president of the United States as long as his life was not mixed with Elise's life. If David and Elise continue their relationship, then their relationship will both destroy their respective futures. Thompson deliberately showed his strength by making Elise injured while dancing. David finally left Elise in the hospital and away from him, for the sake of Elise's own security. Eleven months later, David got news of Elise's plan to marry Charlie. Harry contacted David, and invited him to meet in the area near the water and in a rainy state, a situation where they could not be tracked by The Adjustment Bureau. During the meeting, Harry explained that Thompson was overestimating the negative consequences of David and Elise's relationship. Harry also teaches how to move quickly through the door, a way that members of The Adjustment Bureau always do. David manages to find Elise just before the wedding, and reveals the existence of The Adjustment Bureau to Elise and proves it by bringing Elise to move through the door as is usually done by members of The Adjustment Bureau. The Adjustment Bureau continued to chase, Elise who had hesitated finally decided to follow David. After being constantly chased, David decided to go straight to The Adjustment Bureau office. Finally, they were both besieged on top of the office building, they finally declared their love together by kissing each other, knowing that they would split up and David would soon be reset his brain, because it had opened the existence of The Adjustment Bureau to Elise. 0 Response to "The Adjustment Bureau Movie Review"